Tea was the theme this month and I was on dessert. Yay! My favourite course! Watching Masterchef has inspired me to put more effort into how I present my food, and I know my efforts will be appreciated at Cooking Club. I set my sights high after browsing through the book "A Neoclassic View of Plated Desserts", a book which is aimed more at chefs and people with lots of cooking experience I think! And the original recipe also had a Caramel stick, but I ran out of time! The day before I made the Mousse, sauteed the pears, made the pumpkin puree, as well as making my own Spiced Rum to soak the raisin's in overnight for the Creme Anglaise. Sounds like a lot, but it was easy to have a few of these on the go at the same time. Then on the day I made the cake, the creme anglaise and the pear chips. I brought all the separate finished components with me to CookB's house then put it together before serving. I know it sounds like a lot of work, and it was, especially with working this in with making lunches and dinner and keeping the kids from tearing the place down. But I really enjoyed it since I spread it over 2 days so could take my time and experienced a lot of new skills. I'm taking the easy approach, and if you are interested in the recipes for the Honey Cake, Mousse and the Sauteed Pears then go to http://ourkitchen.fisherpaykel.com/2010/03/chai-spiced-honey-cake/comment-page-1/#comment-1838 Thank you Susie for your help! In a small bowl combine the raisins and spiced rum and soak overnight. In a saucepan, scald the milk, cream, cloves and cinnamon stick. Cover the pan and let it steep for 10mins. Whisk together the egg yolks and sugar and temper them into the milk mixture. Cook gently, stirring, until the mixture coats the back of a wooden spoon. Strain and mix in the vanilla extract and salt. While the mixture is still hot, pour it into a blender and process with the pumpkin puree until smooth. Strain and chill over an ice bath. Add the raisins to the cooled cream. These were my favourite part of the dessert as they were so easy and I will definitely do again. Preheat a convection oven to 95C. Using a mandoline or deli slicer, cut the pear into slices about the thickness of a coin. (The thinnest you can go without any holes as then the pear almost looks translucent when dry). Dust a silicone baking mat with half the sugar. Place the pear slices on top and dust witht he remaining sugar. Bake for 30 to 40 minutes or until pears are dry. Cut the cake in eight 3" circles and cut a circle from the centre of each. 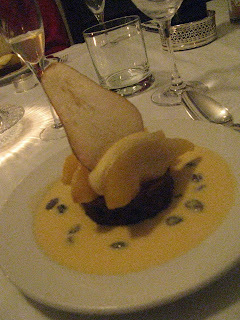 Sauce each dessert plate with the creme anglaise and place a cake circle in the centre. Fill the hole in the cake witht he mascarpone mousse. Arrange 3-4 pear slices on top of the cake. Place a small quennelle of mousse on the pears. Garnish with a pear chip and a caramel stick if you wish. I will definitely make each recipe again but maybe separately as an accompaniment to other desserts I make. I loved the rum soaked raisins in the creme anglaise and will definitely take that idea, maybe even just with a basic egg custard to jazz it up. I have saved the rum that the sultana's were soaked in and think I may do a simple boiled fruit cake with it, as I was not going to pour it down the sink! CookA - you outdid yourself this time. It was by far, the most impressively presented dish any of us has made for CC. Well done you! It also happened to be scrumptious! this looks absolutely amazing. I love the way you have styled the photo and your presentation is top notch. I will have to keep an eye on your site, some the recipes sound divine.